In a rapidly developing country such as India, NGOs (non-governmental organizations) are increasingly playing a balancing role between the government administration and citizens to ensure the latter's easy access to fundamental rights and state/central government's developmental schemes. Being an interface between the common people and government administration, an NGO's role in streamlining the services for the masses is vital for the healthy functioning of any democracy. To plan and drive sustainable development programs through social gatherings and movements, to improve overall standard of living and state of infrastructure in Rajiv Gandhi Infotech Park, Hinjawadi (MIDC) and surrounding area, to be at par with developed countries. All contents © H.E.A.R.T. All rights reserved. Renowned as IT Hub of Magnetic Maharashtra, employing more than 2 Lakh employees, Hinjewadi IT park is facing major traffic related problems from last many years and various measures taken in the past to improve the situation have turned out to be a failure. It is an everyday struggle for the IT professionals, who have to spend nearly one hour in traffic every morning and evening. The various announcements about proposed alternate routes are making rounds in the news for last 5+ years with no conclusive results seen on the ground. The two lakh-odd software professionals commuting to Hinjewadi continue to navigate their way through horrendous traffic jams that show no signs of improving soon. The area that boasts of world-class infrastructure is still a commuter’s nightmare. Unending traffic jams stretching for hours are the norm. Few of the main reasons for traffic jams here is the large number of encroachments on the main roads approaching Shivaji Chowk , unavailability of alternate routes and high number of private vehicles due to lack of efficient public transport which clog the road during the morning and evening hours. The problems would intensify further as the IT Park is likely to employ seven to eight lakh people in future. Many new hotels, establishments and a residential schemes of 2,000 flats+ are also being developed in the area, which will result in a further increase in the number of vehicles. 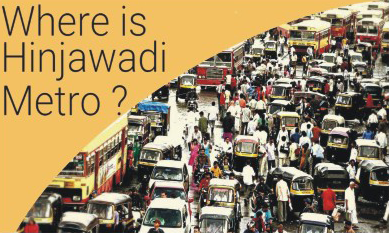 Moreover, Hinjewadi is also the main market for residents of the eight surrounding gram panchayats. The town planning scheme of Mahalunge is expected to help with alternate route but this is a long term solution as it will take 2 to 3 years more with the current pace. METRO will not be a reality for next 5 to 7 years. For the past few years, six villages, including Hinjewadi, Maan, Chande, Nande, Marjuni and Mahalunge, have been facing a severe drinking water crisis. With continuously growing population in the area this water crisis is going to go from bad to worst in years to come. Many societies are dependent on tankers for even regular use water. 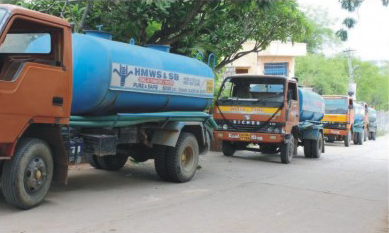 While villages adjoining Hinjewadi receive water supply every two days for 20 minutes, housing societies near IT Parks in Hinjewadi have to completely rely on water tankers during summer. The efforts to get water from Mulshi dam may not be fruitful due to unavailability of adequate water to meet the need. Options to get Water from the Kasarsai dam or from Mangir Baba Water scheme need to be explored at broader level. The Hinjewadi IT Park has witnessed a significant increase in residential properties in the last few years. There are multiple illegal hotels and tea, snacks, vegetable shops in the surrounding areas. The inadequate measures to manage garbage and segregate it are leading to health and hygiene issues. The garbage is being dumped illegally in open areas and the same is being set on fire during night and early morning hours, leading to air pollution. Around 10-12 tons of garbage is generated in every village daily, which excludes that from hotels. Nearly 50,000 residents are affected by rampant dumping and burning of garbage around their housing societies near the Hinjewadi IT Park. The major contributors to this are the small shops and hotels. 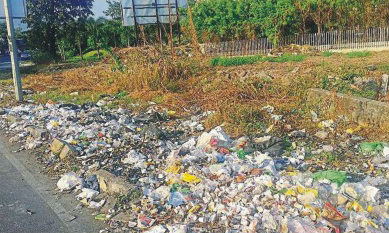 There is no proper place near Hinjawadi and Maan where the garbage can be treated properly. Hinjawadi, Maan and Mulshi Gram Panchayat have demanded two acres of land from MIDC to set up a treatment plant, but it was not sanctioned. The STPs in some of the societies release water on the roads causing sanitation issues. All the global customers and visitors are welcomed to a pathetic view in India’s third largest and Magnetic Maharashtra’s number one IT park. With increasing population, new housing societies and rapidly growing encroachments in the area this issue is going to go beyond control if no immediate steps are taken for Sanitation, Garbage and solid waste management. Before the IT industry arrived, Hinjawadi and surrounding area was largely agricultural. Of the about 1,000 acres of farmland during the 1990s only about 150 acres remain even as the population burgeoned from 5,500 in 2001 to over 50,000+ now. The link between rapid urbanization and crime-rate spike is hardly tenuous. It is a widely accepted that the social churn that comes with rising urbanization, modernization, and inequality, contributes to crime. The crime rate in Hinjawadi is quite high for a small suburban area. The 110-acre Hinjawadi premise is outside the main city, and there is a lot of vacant land in the IT Park. These areas are risky due to being isolated. 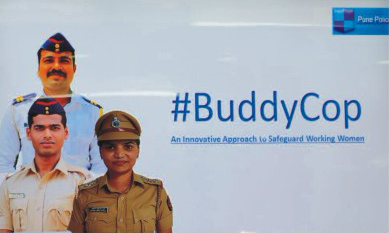 Major companies maintain a 24X7 safety helpline across its offices, extensive CCTV surveillance, female employees are advised to leave the campuses before 8 pm, cabs and buses have panic buttons.